A2Z was contracted by the Joseph B. Fay Company to clear and grub six acres of land at the Interstate 95, Cowenton Road overpass. The targeted completion rate was four to six days per acre. The scope of the job required removing all vegetation within the limits of disturbance to the satisfaction of the project engineer. This included any existing fencing and the removal of all debris. 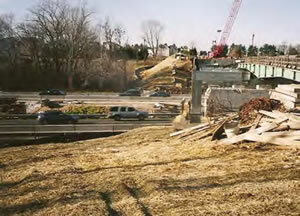 The site was left in a rough grade condition, ready for excavation. Before the job could start, Miss Utility was contacted, so all underground utilities could be marked. The utilities were located before the digging or excavating could be started. and vegetation need to be protected. A three man crew arrived along with an excavator, bobcat and power tools needed to complete the contract. The crew checked to make sure all erosion control devices were in place, then they started at one end and methodically worked their way to the other, removing all vegetation as they went. All marked trees in the work area had to be saved per the site plan. All large trees had to be topped off if they were near wires or buildings. Along the limits of disturbance the roots had to be cut with a chainsaw to protect adjacent private property. All existing stumps were also removed. 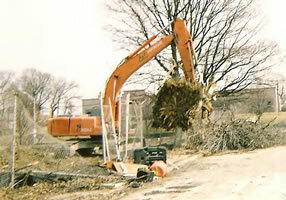 A root rake was used to pick up small debris. The crew participated in daily tailgate safety meetings. The worksite contained several different crews, and everyone needed to be aware of their surroundings to assure the safety of everyone. All debris including trees, shrubs, roots, stumps, all vegetation and existing fences were loaded into 30 yard containers hauled by A2Z‟s fleet of roll-off trucks. The trash and fences were disposed of at a local landfill. The recyclable vegetation, including trees, roots, stumps and bushes went to a local recycler where it was ground into mulch.